Award-winning V++ software from Digital Optics makes advanced scientific imaging and spectroscopy easy. Sophistication, speed, power and full Windows compatibility all come together in a single seamless package. V++ is used in more than 60 countries for thousands of applications in physical, biomedical and forensic sciences. As well as cameras and frame grabbers, V++ can control a variety of laboratory equipment including scanners, filter wheels, microscope stages and more. You can automate complex serial communications tasks and make full use of Dynamic Data Exchange (DDE), with V++ acting as either a server or a client. VPascal is a full featured high-level programming language for automating imaging tasks. It has expressions, looping, control structures, variables, functions, multi-tasking and much more, but remains easy to use. 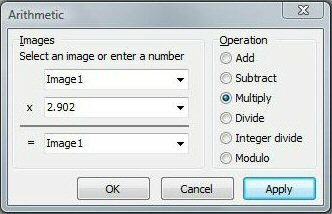 VPascal implicitly understands image, vector and matrix math so you can calculate complicated image expressions in a single line of code by simply writing out the formula. Your programs can create their own toolbars and menus.